As incredible as the OLED display looks, the Alienware 13 doesn't quite deliver the performance needed to justify the premium price. Within the gaming-oriented wing of the broader PC market, Alienware are probably one of the more distinct brands out there. Even if you haven’t bought one of their (admittedly) expensive hardware before, you’ve almost certainly heard of them. And even then, if you somehow haven’t, it feels you have to have at-least felt their influence on the market. Sure, no single company or brand is responsible for trapping the gaming tech market in an endless cycle of neon-lit glowy-metal-sci-fi-death-machine aesthetics. However, if there was a single culprit, it’d probably be Alienware. 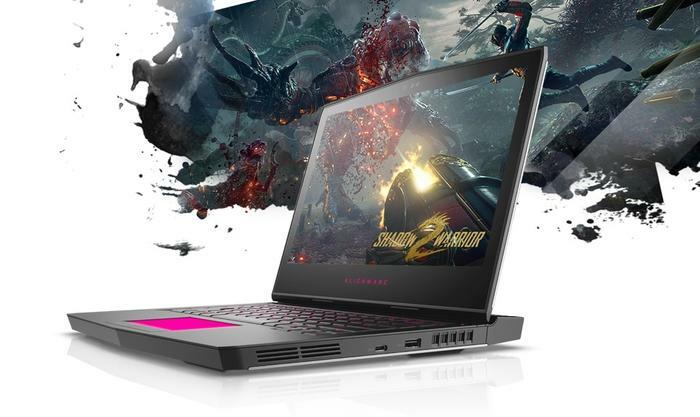 Their success with the formula has bred plenty of pretenders and there are a scant few gaming brands who haven’t succumbed to Alienware’s take on what gamers want. If you can’t beat ‘em - join ‘em - and if they want glowy-metal-sci-fi-death-machines, give em glowy-metal-sci-fi-death-machines. As with every Alienware laptop before it, the new Alienware 13 promises to combines stunningly-powerful performance and incredibly-mobile design. The takeaway isn’t just that it’s a portable PC capable of delivering good performance on the go but a slick-looking’ glowy-metal-sci-fi-death-machine that isn’t a pain to carry with you. It’s the kind of gaming laptop you’ll want to show off. Especially since this time around the Alienware 13 comes touting a slick OLED screen that promises to make to leverage the next-generation display technology to tap into a world of visual fidelity still unavailable to most. Summing things up, the sell isn’t just that this Alienware 13 is Alienware’s best and “most Alienware” A13 yet. It’s that this is the kind of gaming laptop that’s ready to set a new bar for the gaming laptops of the future to be measured against. Knowing Alienware’s success with that approach in the past, that’s an exciting idea. The new Alienware 13 comes in a number of configurations. However, the (almost) top-of-the-line model we reviewed boasted a 13.3- inch QHD (2560 x 1440) OLED Anti-Glare 400-nits touch-sensitive display and came powered by a Intel Core i7-7700HQ processor and 16GB of DDR4 RAM. Under the hood, the new and improved A13 gaming notebook also boasts a hefty 512GB SSD and a noisy Nvidia 1060 graphics card. It also comes with a 76 Wh Lithium Ion battery and Windows 10 Home pre-installed. When it comes to ports, it's packing an RJ-45 Killer Networks e2400 Gigabit Ethernet Port, two SuperSpeed USB 3.0 Ports (one with PowerShare), two USB-C slots (one with support for SuperSpeed USB 10Gbps, 40Gbps Thunderbolt, and DisplayPort), a HDMI 2.0 output, a Mini-Display 1.2 output, an Alienware Graphics Amplifier Port and a set of 3.5mm jacks (one for a headset, one for a microphone).